So how do we navigate the tricky political conversations we’ll encounter this December? We’ve compiled a few non-partisan resources with advice on all the thorny conversations you might find yourself having this month. Before you dive into comprehensive policies and topics, it’s important to brush up on the basics. How does the American government work? How does a bill become a law? What do parties stand for? What is the Electoral College? We’ve dedicated a whole page on our website to these basics, and you can read more by clicking here. Are you relying on fake news? Did you read whole articles or just scan headlines? As more and more of us get our news through social media, it is up to us as consumers of news to separate fact from fiction and hard news from personal opinion. A recent story by NPR outlines ways to improve media literacy so that you can reference reliable sources during your conversations. Director of the International Fact-Checking Network at Poynter, Alexios Mantzarli, and Melissa Zimdars, assistant professor of communication and media at Merrimack College, suggest looking at who is quoted in the story and what they’re saying, reading the comments and the ‘About Us’ section, paying attention to the domain and URL, and several other tips. What if you knew how a person with different political views would react to your politically charged comment before you even said it? Believe it or not, there is a new tool to help you navigate these conversations, test your diversion skills, and find common ground on any issue. Drawing on her background in psychiatry and political psychology, Karin Tamerius created Angry Uncle Bot, a chat simulator to help users discuss difficult topics such as healthcare, election outcomes, and more. Food can also serve as a way to bring people together! That’s why so many organizations use dinner conversations as a vehicle for political discourse. For example, Make America Dinner Again is a nationwide organization that brings people with different political views together over dinner. Attendees use the dinner as a way to listen rather than argue. “You only learn from testing your beliefs, defending your beliefs, being able to be coherent and articulate about your beliefs — and being challenged,” said one attendee in an interview with NPR. It may be true that politics is much more divisive these days, but that doesn’t mean we should take these conversations off the table altogether. 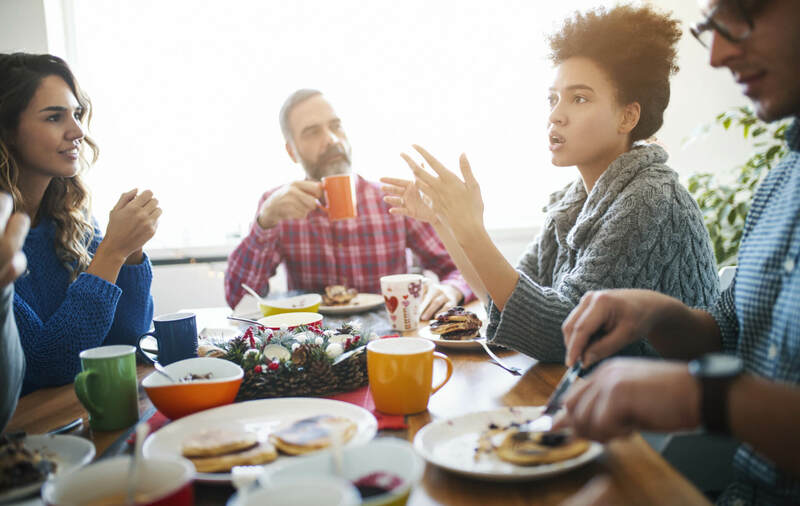 So if someone asks you what you’re bringing to the table this holiday season, your answer is easy: civil conversation to listen, learn, and hopefully find common ground. Do you need more inspiration? This three minute video celebrates our differences and reminds us that sometimes we have more in common with each other than we realize. This article originally appeared in the December 1, 2018 issue of Wide Angle, our regular newsletter designed, we hope, to inform rather than inflame. Each edition brings you original articles by Common Ground Solutions, a quiz, and a round-up of news items — from across the political spectrum — that we think are worth reading. We make a special effort to cover good work being done to bridge political divides, and to offer constructive information on ways our readers can engage in the political process and make a difference on issues that matter to them. Sign up below to receive future issues.